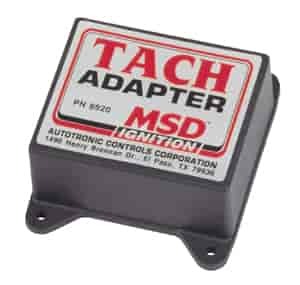 If you are triggering an MSD Blaster, 5,6, or 7 Series Ignition with its white wire or points terminal, you will need this Tach Adapter. This unit will correct the operation of most voltage triggered tachometers or fuel injection systems that do not work directly off the tach output terminal of the MSD Ignition Unit. If you are using the magnetic pickup input (green and violet wires) to trigger your MSD Ignition, you will need the #121-8920 Tach Adapter. This will correct the operation of most voltage triggered tachometers that do not work directly off the tach output terminal of the MSD Control. This Adapter should also be used on current triggered tachs (hooked in series with the ignition switch). 8920 is rated 5.0 out of 5 by 4. Rated 5 out of 5 by My Daddy1320 from Mark Eddy, Sykesville MD , just in time Every thing works great now. Tach works like its suppose too. Rated 5 out of 5 by SVOSkippy from Worked Great! Just what I needed. My factory tach is working again! Rated 5 out of 5 by Jim W from MSD Tach adapter Always a good result with Jegs! Shipping has always been prompt.